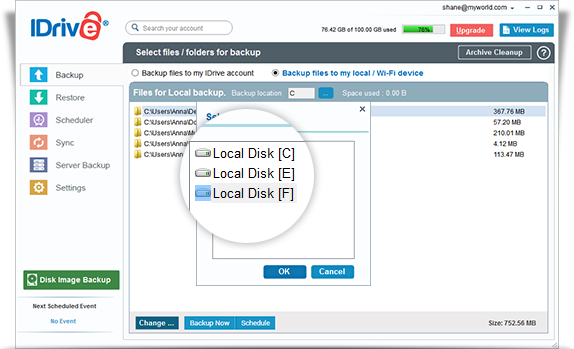 What is IDrive Local Backup? How do I create a Local Backup of my file(s) / folder(s) on my system? How do I add file(s) / folder(s) to my local backup set? How can I schedule a Local Backup? Can I create a local backup for my MS SQL, MS Exchange, MS SharePoint, Oracle and Hyper-V servers? How do I create a Local Backup of my file(s) / folder(s) to the IDrive One device? Can I view files backed up to the IDrive One device on my computer? On the ‘Restore’ tab, I have selected my external drive in ‘Local device’. Yet I am unable to view the data backed up to the device. What should I do? How can I check the status of my current Local Backup operation? What will happen to my scheduled Local Backup job, if I log out of my Mac system before the scheduled hour? IDrive encrypts all of your important files using 256-bit AES encryption while storing them to any local destination such as external drives or mapped drives. This way you can prevent unauthorized access even if the drives are stolen or misplaced. Note: Drives of FAT32 format can backup files only up to 4 GB in size. Login to the IDrive application with your Username and Password. From the Backup tab, select the ‘Backup files to my local / Wi-Fi device’ radio button. 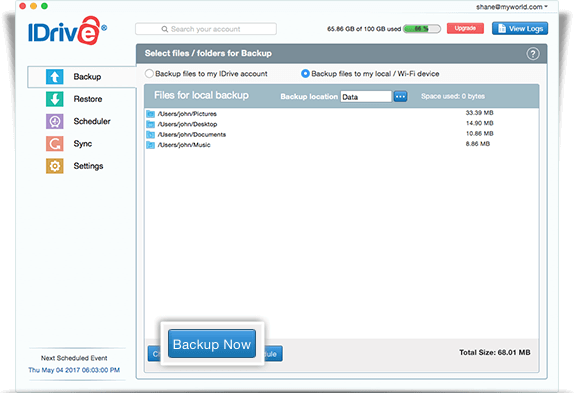 Click the ‘Change…’ button and select files / folders for backup. 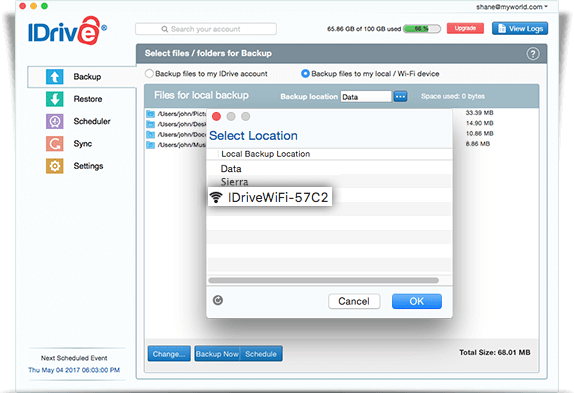 Click and select a location to backup your data to the local drive. Click Start Local Backup Immediately. 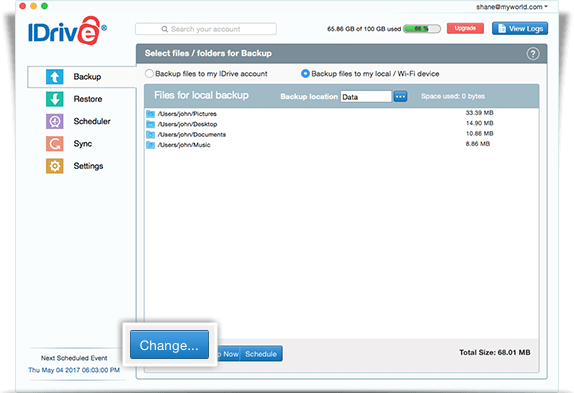 Click the ‘Change…’ button, and the 'Select files / folders for Backup' screen appears. Select the file(s) / folder(s) to add to the backup set. 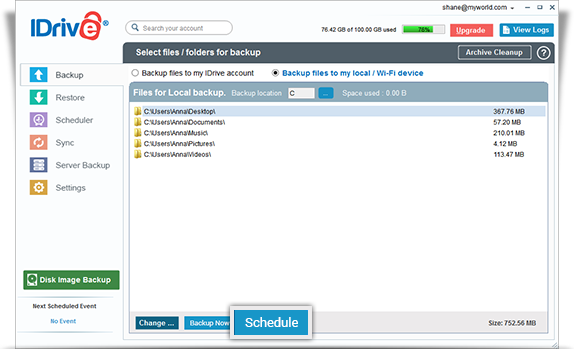 Click Schedule Backup and the 'Schedule backup' screen appears. By default, in the 'Backup set name' list, LocalBackupSet is selected. Modify the following scheduler parameters to schedule local backup. Backup start time: Set the time at which your scheduled backup should start. Daily Schedule: Select this option to run your backup jobs daily. Week-Day(s): Select the days of the week on which you wish to run your backup jobs. Hourly Schedule: Select this option to configure hourly backup operations. Cut-Off time: Set the time at which your scheduled backup should stop. Email notification: Select this option to receive email notifications on the status of the scheduled backup job. Enter the email address on which you want to receive the notifications. Notify me on desktop: Receive notifications on the desktop regarding the status of scheduled backup job. Start the missed scheduled backup when the computer is turned on: Select this option to resume a missed scheduled backup job due to the computer being turned off. Yes, you can create a local backup for your MS SQL, MS Exchange, MS SharePoint, Oracle and Hyper-V servers using IDrive. Connect to IDrive One from the list of available Wi-Fi connections. 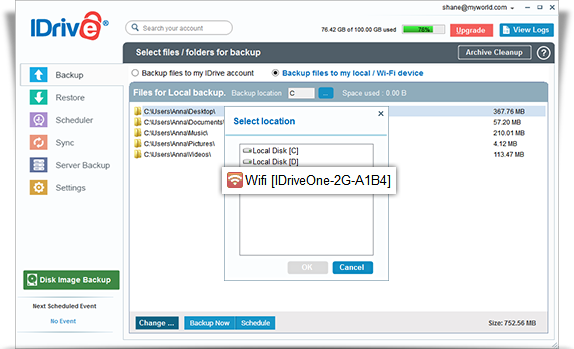 Click and select IDrive One device to backup your data to the drive. Click ‘Start Local Backup Immediately’. Files backed up to IDrive One device cannot be directly viewed on your desktop, as all your data are encrypted using 256-bit AES encryption. 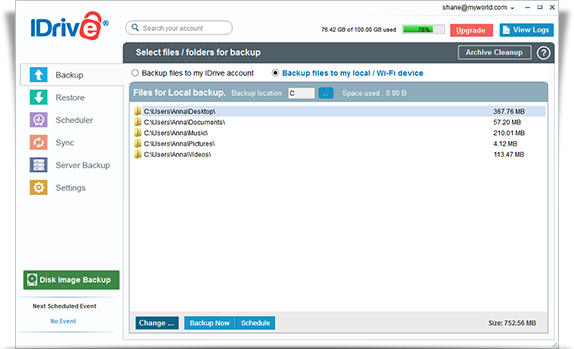 You must restore data from the IDrive One device via the IDrive desktop application to your computer to view your files. Sometimes, locally backed up files may not appear due to intermittent issues, which can be easily resolved using re-indexing. Go to the Restore tab, and click Local device from the drop-down menu. Note: The ‘Local device’ should be mapped to the drive that contains your locally backed up files. Right-click My Device (the root folder for your locally backed up data), click Re-index files / folders, and on the confirmation that appears, click Yes. 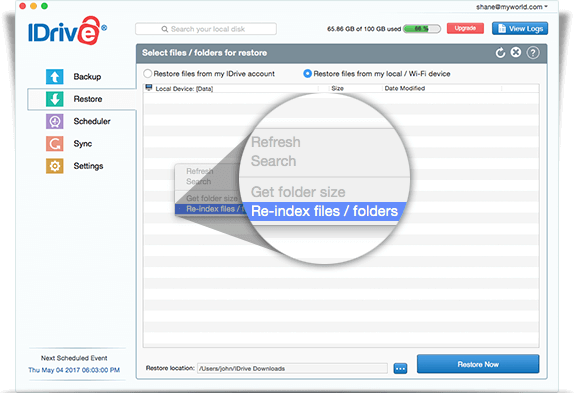 After the re-indexing process is complete, the locally backed up files should be visible. In case you need further assistance, contact support. From the Backup tab, select the 'Backup files to my local / Wi-Fi device' radio button. 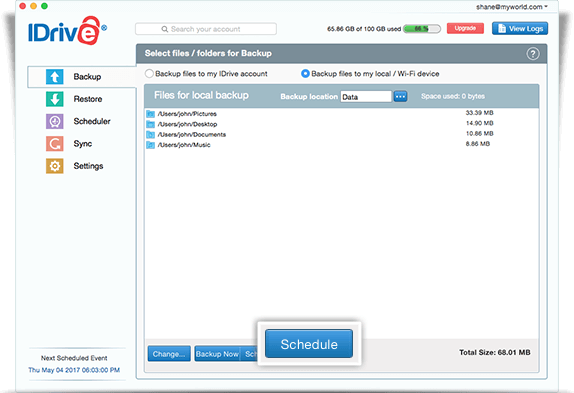 Click the 'Change…' button and select files / folders for backup. Start the backup immediately: Select this option to run a backup job immediately. How can I check the status of my ongoing Backup operation? 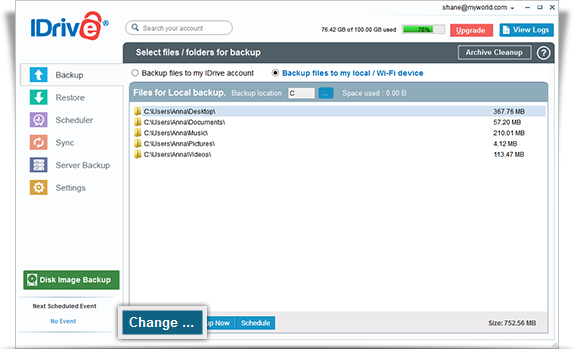 The progress of ongoing local backup is displayed on the left-hand side, click to view details of the backup progress. 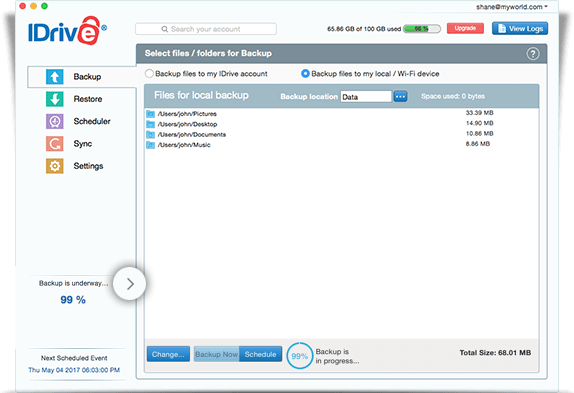 The commonly used local backup destinations are external volumes and portable devices, which get unmounted when you log out of your Mac machine. So, if you log out of your system before the scheduled hour, the local backup will fail. Files backed up to IDrive One device cannot be directly viewed on your desktop, as all your data are encrypted using 256-bit AES encryption. 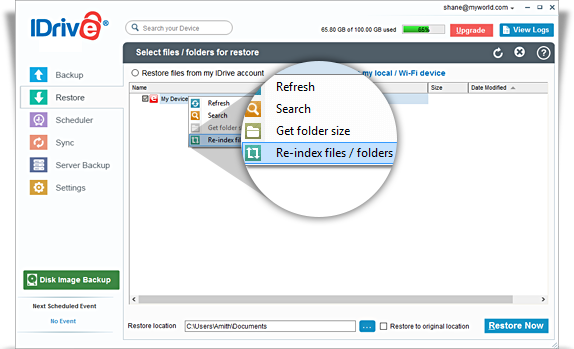 You must restore data from the IDrive One via the IDrive desktop application to your computer to view your files. Right-click anywhere within the Restore View section, click Re-index files / folders, and on the confirmation that appears, click Yes.